There’s no good reason at all that I’m posting this photo of the Bonnie next to the track-clearing plow train. I just like it. 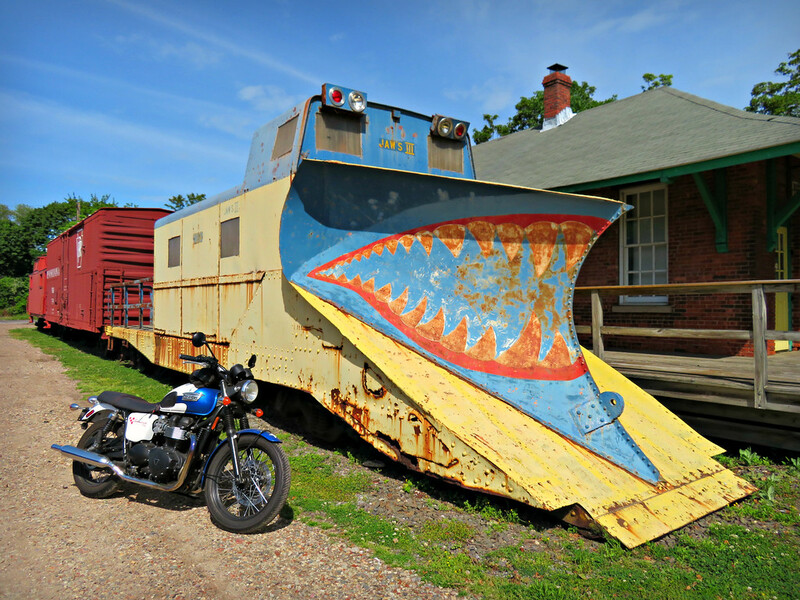 JAWS III sits beside the Long Island Railroad Museum in Greenport, NY. Whenever I stick close to home I seem to find myself out there on Long Island’s north fork. Lately Ive been trying to find ways to kickstart my creativity. Or more accurately, hang on to it. I have no trouble getting inspired or excited about ideas. The follow-through is where I go to pieces. That seems to be the result of expecting too much or being too restrictive with my peculiar rules about what things I should be posting and when. I mean… I’m not writing medical research here. I’m not a business. I’m not a professional writer. I’m not building a “brand.” I’m just a dope with a computer who is recording their thoughts. Somehow I get derailed by the idea that a blog is supposed to be more highbrow than what I might post to Instagram. That’s my favorite social distraction. But because of it’s ease and my low expectations of it, Insta has become a surrogate blog. There – people (I?) seem to be fine with long posts, short posts, no words, 20 posts in a day, or whatever. Anything goes. I need to adopt that type of thinking for my blog. My rigid ideas about blogging aren’t doing me any good. They make me not blog. And I think writing things down is good for me. I suppose more than anything I should just remember it is okay for me to post as much or as little about anything i want, whenever i want. That’s what i need to move towards. Perhaps the trick there, if you want to be in a position to film on a whim, is to have a Go Pro mount on your lid, to have a USB charger socket on the bike & have a camera ready synced to your bluetooth headset tucked under the seat with a nice big SD card in so that if the mood takes you you can whip it out & film & talk, rather than thinking ‘if only I’d thought about it 3 hours ago I could film this stunning road…’. Ahhhh, I feel your pain and frustration. Like you, my blog began and pretty much has remained a personal project. While I know something is driving me to spend time doing what I do I seem to be continually attacked by mental assaults whispering the kinds of things you’ve outlined. Be more serious, be more focused, create content of value, think about blah blah blah. Those mental battles can stifle action or stimulate it. For me, I’m always left asking “Why am I doing this?” It’s the same question I asked when I was in an MFA program in art — Why? Why? I think I’ve figured out the why question. And just as I think I’ll have some peace I get the “What?” question. What should I write. What should I create? I have little advice save for writing and posting. The single most powerful action for me is just taking a ride, making some pictures and dumping whatever came up in my head into a post. Doing that over and over pushes me through whatever creative doldrum I find myself in. The post a day in February challenge does wonders. Allowing myself to write crap and make mistakes is liberating. And no one seems to care that I’m not creating masterpieces. Round and round I go on the why. Sometimes i trick myself in to thinking i’ve got something useful to say. But the reality is, each day that i sit down and plunk something out on the keyboard it is a selfish pursuit. i do it because i like the way it makes me feel. in a funny way, it’s almost like telling myself a story that some other part of me doesn’t quite know. does that make sense? when i read old things back i can be surprised by them – as if they came from some alien place. me but not me. the what. there’s where my weird rules unravel me. i get particularly whacked out about timing. some things have an arbitrary freshness date that i struggle with. yes, i agree that a routine or giving myself a “job” to do can help. Until i go off the rails in an act of self-rebellion. You can’t tell me what to do! My favorite post are when you’re being honest and I guess vulnerable about your life. But they’re all good, we read because we want to know about you. Unless you are intentionally trying to establish yourself as a brand, I don’t see any problem with posting random stuff. Your pictures of roadside oddities are great. Often I just look at them as I go by… Personally, I prefer the blog format than anything associated with Facebook. You have control of your blog and, to me, that’s important.